Your child has worked so hard in speech therapy and can now pronounce the sound(s) he has been working on! The only problem is he can’t say the sound in conversation. How can you help him? Start with a five minute warm-up of words containing the target sound. Practice these words in sentences as well. Next, depending on how much time you have and if you have daily chores to attend to, encourage your child to use the target sound while engaging in the types of activities listed below, while conversing with you. There are a variety of ideas that span age-ranges. The structure of the activity will help maintain the goal: To say the target sound consistently in conversation. Keep the goal in mind at all times during the activity, and remind your child as necessary. You may need to manipulate the vocabulary to have a more optimal choice of target sounds in words (e.g., try “rabbit” instead of “bunny” if you are working on the R sound). Sort the clean laundry (e.g., Daddy’s sock, Joey’s shirt). Clean the apartment (your child can use the Swiffer, recycle, clean up toys, etc.). Pretend play (tea party, school, doctor, Legos, Star Wars, etc.). Play games without too much strategy involved: Pop-up Pirate, Thin Ice, Twister, Perfection (At first don’t set the timer right away. Later, with the timer set, the excitement will make it more challenging to practice target sounds). Fingerpaint inside or sidewalk chalk outside. Narrate a picture book. You can use wordless or worded picture books. Talk about your favorite movies. Have your child tell you about his day (if you weren’t together). If your child watches a television show, have him give you summary. Playground time – maintaining target sound(s) while being physically active is challenging. Go out for ice cream to celebrate how well your child is doing with his articulation! Keeping the goal in mind during these structured tasks will help you learn to monitor your child more effectively throughout each day. 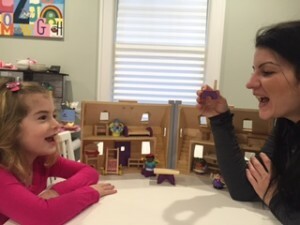 Making an effort to set aside the time to practice carryover of your child’s target articulation sounds will help reduce time in speech therapy. These are tips I often share with parents to use as homework activities in my own practice. You can learn more about me, Stephanie Sigal, on my website. Thanks for reading!